For whom is BeHear NOW intended? We developed BeHear NOW to help people hear better in various situations, taking into account individual preferences and the uniqueness of each person’s auditory system. Hearing loss is an example of “uniqueness” that can be addressed by BeHear NOW, and compensated to some extent depending on the listening/hearing conditions. BeHear NOW was designed to help people with mild-to-moderate hearing loss, who may not need amplification in every hearing situation. It can help clarify dialogue, enhance music appreciation, and improve intelligibility of phone conversations. Is BeHear NOW a hearing aid? 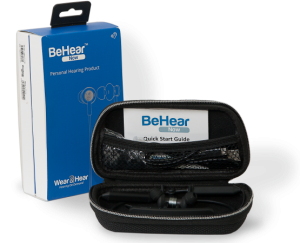 While BeHear NOW uses the same digital signal processing algorithms as most advanced hearing aids, BeHear NOW is not a hearing aid (nor is it a medical device). Can BeHear NOW restore hearing? While the advanced algorithms used in BeHear NOW can improve the hearing/listening experience, they cannot restore hearing completely. How do I know BeHear ear buds will fit me? BeHear NOW is supplied with numerous sets of silicon ear tips and ear hooks in different sizes and styles. We trust that you will be able to find the right combination for your ears. I wear glasses. Can I wear the headset at the same time? Absolutely! The earbuds are “in ear”, with nothing resting on the back of your ear (where your glasses sit). Yes, we offer a limited 1-year product warranty against manufacturing defects. For more information, use this link to see the video instructions, or this link to read the manual. How do I charge the BeHear NOW headset? BeHear NOW is supplied with a micro USB charging cable. Use it to charge the headset from your computer, or together with a standard AC outlet adapter (purchased separately) to charge the headset from a wall socket. Use this link to see the video instructions, or this link to read the manual. What happens if I receive a phone call when listening to music? You can choose whether to accept or reject the call, either by pressing buttons on the control box (located on the headset cable) or using your mobile phone. Can I set the volume level for each ear separately? In the Settings screen there is a balance option. You can slide the silver dot right or left to set the desired amplification balance between left and right ears. This setting is applied to the volume control, in addition to the results of the built-in hearing assessment, and will be active in all operation modes of the headset: phone calls, audio playback and personal hearing amplification. How do I get the smartphone app for the headset? Can I use the headset without a smartphone? Absolutely! You can benefit from the ambient hearing without a smartphone. The smartphone is necessary if you want to run the BeHear NOW control application, but the headset itself includes seven built-in control buttons that allow you to use it autonomously. You can pair BeHear NOW and use it with any Bluetooth device such as a feature phone, music player, laptop, etc. and use it for hearing enhancement, phone calls or listening to music or other recorded audio. Can I use the headset without Bluetooth? Yes. You do not need Bluetooth to benefit from the ambient hearing functionality. However, without Bluetooth you will not be able to stream audio from your mobile phone or music player directly to the BeHear NOW headset. How can I keep the headset from slipping off when the ear buds aren’t in? The earbuds contain magnets and will stick together (even through the wind protectors) in front of your chest. Can BeHear NOW pair with more than one Bluetooth device? Absolutely! BeHear NOW can support multiple audio sources simultaneously. For example, you can listen to media on your laptop, and still be connected to your mobile phone. How do I customize BeHear ? Using the built-in Hearing Assessment in the smartphone app, which applies the results automatically to the four presets (Indoor, Outdoor, Crowd and Live Music) to match your preferences and capabilities. In real-time, using the controls in the Personal Hearing section of the smartphone app to select a preset, fine-tune gain across frequencies, and determine the amount of noise reduction. Use this link to see the video instructions for the Hearing Assessment, or this link for Customizing in Real-Time, or this link to read the manual. How can I improve the intelligibility of speech during a phone call? The EasyListen feature is built into the BeHear NOW headset. It slows down phone speech dynamically and intelligently to improve comprehension, without distorting it, or disrupting the natural rhythm of conversation. I’ve changed smartphones. Can I continue to use my personalized BeHear headset or do I need to reset it? The BeHear NOW headset will continue to operate as a personal hearing amplifier, even without any connection to any smartphone (the parameters are saved in the headset, not in the phone). The smartphone is necessary if you want to run the BeHear NOW control application, but the headset itself includes seven built-in control buttons that allow you to use it autonomously. You can watch this video for specific instructions. Have you used the W&H BeHear smartphone application to run the hearing test assessment? If so, note that the results are applied to the presets (Indoor, Outdoor, Crowd and Live Music), and are programmed into the headset itself (not the phone). Still, we recommend downloading and pairing your new smartphone with the headset so that you can get maximum benefit. Watch this video for detailed instructions. 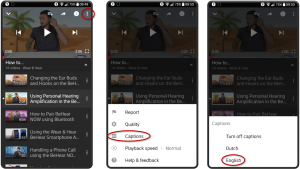 How can I get captions on the tutorial videos? 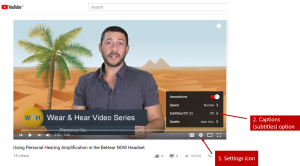 All W&H BeHear “How to” videos support captions. Click the three vertical dots in the upper right-hand corner of the screen. Click the Settings icon in the lower right section of the video frame. Click “Subtitles/CC” to see the available languages. How long does the app upgrade process last? For release 000F (for Hardware Version 1.0.0) and release 000E (for Hardware Version 1.0.1) upgrade time for Android phones is approximately 10-15 minutes. Upgrade time for iOS phones is several hours (therefore, nighttime upgrade with the phone attached to a charger is recommended). The long upgrade process is due to the Bluetooth connectivity framework on iOS and how our headset functions within it. Our developers are working to reduce the amount of time needed to perform the upgrade. If I uninstall the app will my audiogram disappear? The results of the hearing assessment (presented in graph and tabular formats) are stored in the headset, not the app. Therefore, uninstalling the app, or connecting to the headset with a different Bluetooth device, will not affect the results. Why do I see two BeHear devices in my Bluetooth settings? If you are using the W&H BeHear app on an iPhone the Bluetooth option in the “Settings” screen will show two connections for your headset: one for an audio device, the other for the BLE (Bluetooth Low Energy) control. Although it is confusing, it is the way iPhone works with BeHear. Can EasyListen (slowing down speech) be used for the television? HearLink may be helpful in this case, however. Because it sends the audio signal directly to the paired BeHear NOW headset it eliminates ambient noise, room reverberation, and other types of sound interference which hamper understanding of speech from the television. How is HearLink Different from other Audio Transmitters? There are many audio transmitters on the market, but HearLink has some unique features that set it apart as the transmitter of choice for assistive hearing. It supports ListenThrough™ technology to allow important ambient sounds (like a conversation with a TV viewing partner, or the doorbell) to pass through on top of the streamed audio. During incoming phone calls the audio stream will be stopped and then automatically resumed when the call is completed. It supports up to two BeHear® NOW headsets simultaneously. What comes in the BeHear NOW box? The box includes a headset, a USB charging cable, a travel pouch, three types of silicon ear tips in different sizes, three pairs of ear hooks in varying sizes, 2 pairs of wind protection covers, and a printed Quick Start Guide. How long will the BeHear NOW battery last? Note: A full charge takes about 2 hours. What comes in the HearLink box? The HearLink box includes the transmitter, a micro-USB cable for charging directly from the television (where supported) or from an electrical wall socket, two audio cables (3.5mm and 2xRCA for convenient connection to various appliances), and technical documentation. How much hearing amplification gain does BeHear provide? The maximal gain provided by BeHear NOW is approximately 45dB. Which operating system does the BeHear smartphone app support? The BeHear NOW smartphone application supports both Android (from version 4.4 and up) and iOS (from version 9 and up). Is the BeHear NOW headset waterproof? No. We are creating a different model for our “Wear & Hear” family called BeHear Active which will suit people with active lifestyles. Where can I find the full BeHear NOW product specifications? Can HearLink connect to other Bluetooth devices, as well as BeHear? HearLink’s Bluetooth connectivity is not restricted to BeHear Now headsets. You can download the HearLink User Guide here for more information. If I’m using HearLink can anyone else hear the TV? This depends on your specific TV. Some televisions support dual audio output devices while others do not. One way around this is to purchase the Wear & Hear “Harmony Bundle” which includes two headsets and one HearLink. Both you and the other person will then be able to hear the TV without ambient noise and optimized for your own hearing (while staying aware of important sounds, and able to speak to and hear one another). Where does the BeHear headset appear in the Bluetooth device’s pairing screen? Depending on the application, BeHear may appear either as a headset or as a headphone, just like most other Bluetooth headphones. For most music players it will be listed as a “headphone” while for messaging services, such as Skype/Viber/WeChat etc., it will be listed as a “headset”. Experiment with the different styles and sizes of silicon ear buds and ear hooks supplied with the headset. Use this link to see the video instructions, or this link to read the manual. Try using the supplied wind protection covers. Use this link to see the video instructions, or this link to read the manual. Ambient noise bothers my music enjoyment. Reduce the volume of ambient sound using either the right control box or using the phone app. Use this link to see the video instructions, or this link to read the manual. Phone calls are not being routed to my headset. Verify Bluetooth pairing. Either the device has not yet been paired or has been erased from the pairing list. Turn the headset on and place it into pairing mode, then, check if it appears in the connection menu. The Bluetooth connection keeps cutting out. Verify that you are not more than 10 meters (approx. 30 feet) away from the device. If you are using BeHear NOW outdoors, we recommend that you carry your phone on the right side of your body. When indoors, the Bluetooth radio waves can bounce off walls and it doesn’t matter on which side the phone is located. Outdoors the phone needs a direct line of sight with the antenna, which is on the right side of the neck-band. Personal hearing is interrupted by smartphone notifications. When connected to a phone, the phone notifications take precedence over hearing amplifications. This is so that you don’t miss any important phone calls. Therefore, we recommend changing the phone settings to turn off key tones such as touch sounds, keyboard taps, and some notifications according to your preferences. Phone calls will still take precedence, but this will greatly reduce the number of times the hearing is “interrupted”. Settings for phone notifications behavior is usually accessed through the smartphone’s “Settings” menu, in a section called “Sounds and Notifications”. How do I know my headset is up-to-date? Updates are sent automatically to the W&H BeHear app. You can verify the availability of an update by checking the “Headset Update” screen through the app’s main menu. If there is a new version available, follow the on-screen instructions to update the headset. My headset is behaving erratically. If your BeHear NOW behaves unexpectedly there are three ways to reset it: you can restart it, remove the Bluetooth connection data, and/or restore the original factory configuration. To restart BeHear in a simple reset, connect it to the charger. All configuration and connection data will be preserved. Power on the BeHear NOW headset. Press and hold the Power button + the middle and bottom buttons on the right control box simultaneously for approximately 8 seconds, until a purple L.E.D. blinks once. Power off the headset and then power it on again. Press and hold the Power button + the middle and top buttons on the right control box simultaneously for approximately 8 seconds, until a yellow L.E.D. blinks once. Connect the headset to the charger. Disconnect the headset from the charger and then power the headset on. Is it possible to turn down the volume of the audible notification beeps? Unfortunately, it is not possible to change the volume of the headset notification sounds. We plan to include this improvement in a future version of the software. Is BeHear ambient noise reduction the same as Active Noise Cancellation (ANC)? BeHear does not integrate Active Noise Cancellation because that technology is not helpful for listening to ambient sounds. Actually, the purpose of Active Noise Cancellation is to cancel out all sounds that come from the environment, while for hearing enhancement we strive to identify and clarify important sounds. So, the noise reduction technique in BeHear uses our field-proven algorithms on the microphone signals that are later amplified, according to the customer’s hearing loss parameters. 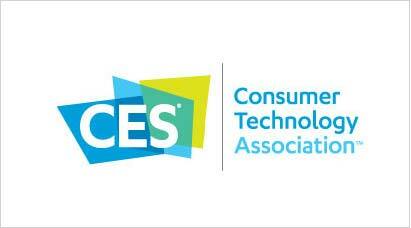 For more on this topic, see our blog post about active noise cancellation. No sound is coming from the headset.